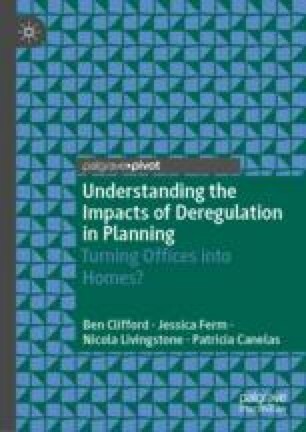 This chapter considers the wider intellectual context for the government making office-to-residential change of use permitted development in England. Academic theories around neoliberalism are discussed, explaining the usual understanding of ‘deregulation’ as a key component of neoliberalism, but also considering some critique of this in terms of work on regulatory capitalism and the more complex relationships between modernisation, the contemporary state and the private sector. Previous studies from other sectors on the implications of deregulation (there being surprisingly little work directly on this and planning) are briefly outlined, for example work demonstrating the inadequacy of voluntary approaches to regulation to protect the natural environment.